Don’t say a word until your attorney gets there, said one member of the editorial board. Oh, I’d invite them in, because I’d be so curious about what they were interested in asking me, said another. Just because I’d tell them they could ask, doesn’t mean I’d answer, said another. Don’t say a word without your lawyer, the first repeated. To be clear, the FBI has no interest in asking your editorial board any questions. During the past two and a half years, the Wild Idaho Rising Tide (WIRT) Activists House, open daily between 12 noon and 8 pm, has provided our collective a combined working space, monthly meeting place, information resource center, and visiting/resident climate activist home . 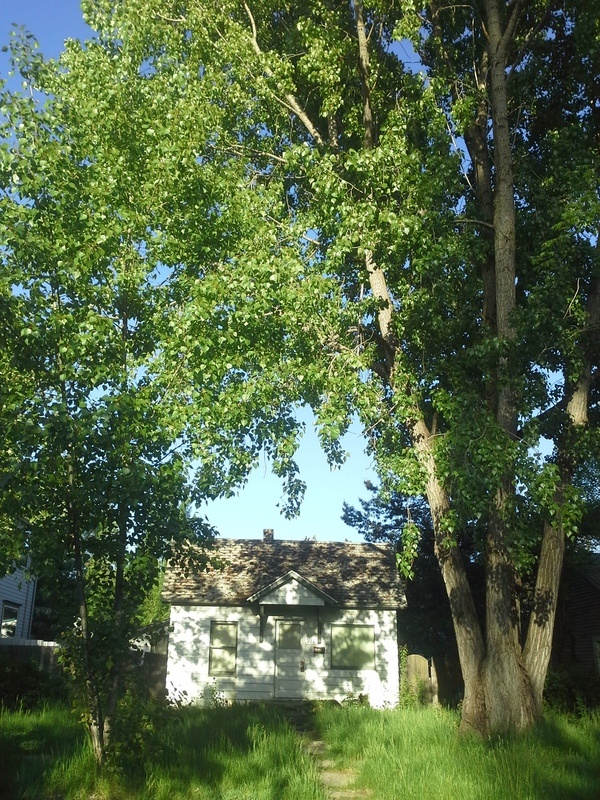 Established as a regional base of operations in mid-July 2012, after a seven-week transition and intensive search and thanks to the gracious hospitality and generosity of many, amazing, fellow activists and allies, the hundred-year-old, two-bedroom, one-story house, beneath a huge cottonwood tree near downtown Moscow and the University of Idaho, filled with essential furniture and household goods donated during and after the WIRT Activist House-Warming Party [2, 3]. Our group has been fortunate to host meetings, potlucks, movies, fundraisers, memorials, and other convergences in the living room, kitchen, enclosed porch, and fenced yard, and to accommodate traveling activists, musicians, presenters, and guests in the spacious, rear bedroom with large windows and a walk-in closet and in the living room and porch of this small, humble abode. The Monday, January 19, 2015 Climate Justice Forum radio program hosted by Wild Idaho Rising Tide (WIRT) gratefully welcomes again Jesse Cardinal, a coordinator for Keepers of the Athabasca and co-organizer of the former, annual Tar Sands Healing Walk near Fort McMurray, Alberta. Jesse will describe the ongoing land protection efforts of the Northern Trappers Alliance, who have been “holding the line” with road blockades north of LaLoche, Saskatchewan, since November 19, 2014…, to prevent access by numerous oil and gas companies to exploration camps that have multiplied across the region during the last seven years. Broadcast on progressive, volunteer, community station KRFP Radio Free Moscow every Monday between 7:30 and 9:30 pm PDT, live at 90.3 FM and online, the show covers continent-wide climate activism and community opposition to dirty energy developments, thanks to the generous, anonymous listener who adopted program host Helen Yost as her KRFP DJ. Various north Idaho city, county, and state government elected and agency officials and two environmental organization representatives banned the public from several closed meetings during recent months, while they discussed the environmental and public health and safety threats and opportunities for resolution of increased coal and oil train traffic across the Panhandle [1-3]. In the wake of critical news stories denouncing this fiasco from Sandpoint to Boise, Idaho, and from Spokane, Washington, to Washington D.C., excluded, rightfully appalled citizens expressed regrets that participating government entities and environmental groups denied them access to these essential conversations about such crisis topics, even while public awareness has grown in response to fiery oil train derailments across North America during the 18 months since the tragic Lac Megantic disaster that incinerated 47 lives in July 2013. 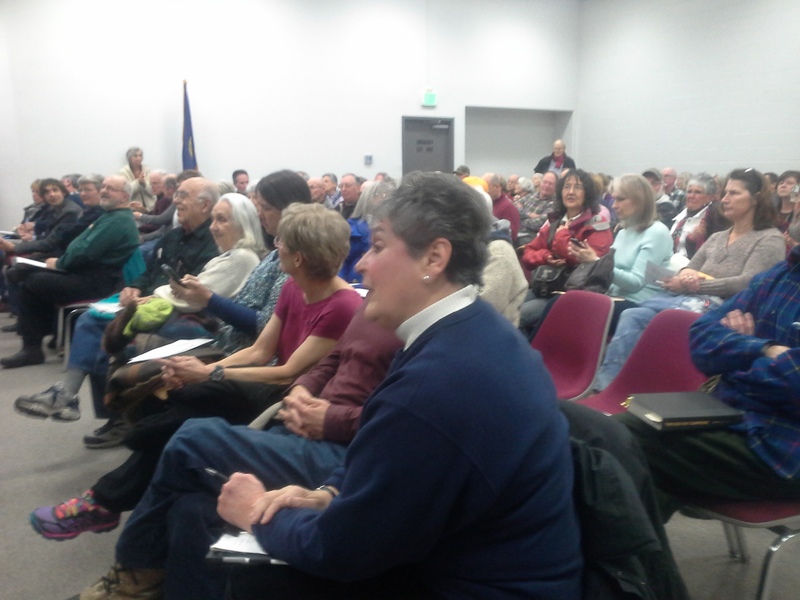 Perhaps in embarrassment, the City of Sandpoint, Idaho, sponsored and hosted a community forum on north Idaho coal and oil train issues at 5:30 pm on Wednesday, January 14, 2015, in Sandpoint City Council Chambers at Sandpoint City Hall, 1123 Lake Street . Sandpoint Mayor Carrie Logan called for this public meeting in mid-December, to provide an opportunity for citizens to hear current information about expanding coal and oil rail traffic and to discuss the risks, challenges, and possible solutions of community safety and wellbeing currently compromised by air, water, and noise pollution, crossing delays, economic impacts, and potential train derailments. Oh, a fairy tale from Viola (Letter to the Editor, Van Thompson, December 28): Perhaps we should look at reality here. The [proposed] eastern alignment [of U.S. Highway 95] is perhaps shorter by a few hundred feet. And it is not safer than are other alignments. Mr. Thompson ignores the fact that the highway, had it been built – illegally – ten years ago, would have left Reisenauer Hill as it is, and accidents would have continued to occur on the hill in that decade. Were the eastern alignment that ITD prefers to be built now, again Reisenauer Hill would be left, dangerous as it is, likely never to be made safer. The “family at the bottom of the hill” will continue to have unwanted vehicles in their front yard. Bakken shale oil trains in northern Idaho travel beside the Kootenai River, through downtown Bonners Ferry and Sandpoint, over and along Lake Pend Oreille, and adjacent to U.S. Highway 95, before heading west into Washington. Within the nexus of Panhandle tracks carrying greater numbers of dangerous trains every month across crumbling bridges and the lake, residents truly wish to protect their lands, waters, and the future of their children and grandchildren. They understand the toxic and transient nature of unsustainable fossil fuels among the life of this Earth, and some have been boycotting them at every opportunity for decades. One derailment on a bridge or over the regional aquifer would ruin the drinking water of thousands of people. 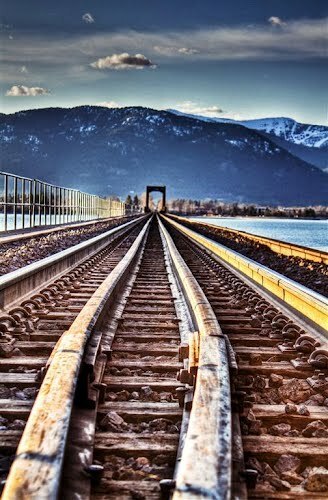 Are the profits of Burlington Northern Santa Fe (BNSF), Montana Rail Link (MRL), and Union Pacific (UP) railroads so imperative that they would chance derailments and bridge collapses near rivers and lakes? As oil and gas companies scrape the bottom of the easily recoverable barrel to extract the largest possible revenues, they obviously are evading the burdensome infrastructure and operating costs associated with preliminary processing of tar sands and fracked crude. Without these adequate precautions, Bakken crude oil contains extremely volatile constituents that ignite too readily to be safely transported in bulk. But North Dakota regulators have only considered or required that crude be conditioned, instead of mandating the more thorough and expensive stabilization procedures and equipment that separate and remove volatile compounds prior to shipment, but that the oil industry has been resisting for years. Through combinations of these factors, governments and oil and railroad corporations ensure that American citizens passively and endlessly bear (but not accept!) the physical and fiscal risks and costs of oil trains, while these industries and their pet politicians take all the profits. Flammable oil and dusty coal are transported and stored on a regular basis within some of the largest population centers in U.S., mostly located around railroads. A leak or spill of volatile Bakken oil constituents from a transfer pipe or railroad tank car could ignite and set the heavier compounds on fire and start an uncontrollable, days-long conflagration that no municipality has the experience or the gear to combat. 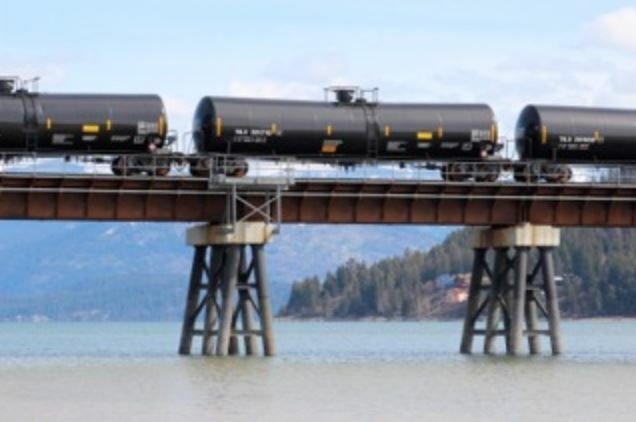 Are existing north Idaho politicians and environmental groups determined to safeguard local communities by insisting on prohibition of crude oil train shipments with highly volatile constituents? The majority of conservation organizations advocate overdue removal from nationwide tracks of aging Department of Transportation (DOT)-111 tank cars – the “riskiest models on the rails for accidents and oil spills” – as demonstrated by a November 2014 trip to Washington, D.C. by Lake Pend Oreille Waterkeeper executive director Shannon Williamson and allied colleagues . They also petitioned for other more rigorous oil train regulations during rulemaking sessions at the U.S. Department of Transportation. In early December 2014, the public interest environmental law organization Earthjustice, “on behalf of Sierra Club and ForestEthics, challenged the Department of Transportation’s denial in November of the groups’ petition for an immediate ban on the most hazardous DOT-111 rail tank cars carrying explosive Bakken crude oil” . The legal action attests that this type of car, prone to punctures, spills, and fires during train accidents, represents two of every three tankers transporting oil throughout the U.S. Asserting that it has sufficiently implemented measures to respond to the imminent hazards posed by these rail cars, by only issuing a safety advisory, the Department of Transportation faces growing legal opposition demanding further actions to protect communities susceptible to “bomb train” derailments, leaks, and explosions. Lives will remain vulnerable until outspoken opponents of oil, coal, and tar sands together raise escalating, cooperating resistance to their transport, in any form or manner, past their homes and businesses. The inherent dangers of Northwest fossil fuel passage persist, as apparent in the big rock slide that closed a main BNSF rail line in north Idaho, connecting Montana to Washington, and naturally shut down oil and coal trains for a couple days in late November 2014 . Perhaps nature was sending a warning about not just these shipments but about an influx of Canada Pacific freight and tank cars (hauling tar sands oil?) 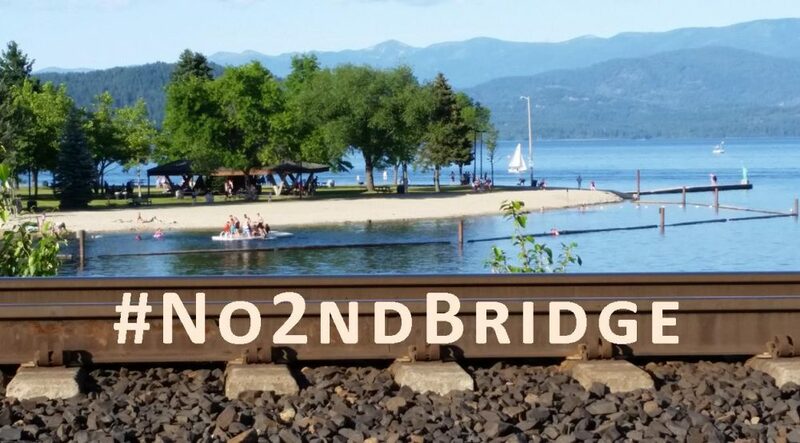 recently seen by Sandpoint residents on local railroad stretches . June 2014 protesters of four of five Montana megaload assembly plants also noticed some of these cars on the Montana High Line east of Glacier National Park, likely utilizing one of only a few international rail entrances into Idaho and Montana. Just because everyone wants an improved U.S. Highway 95 Thorncreek to Moscow doesn’t justify ignoring law, especially by the government. We still drive on old U.S. 95 because the Idaho Transportation Department (ITD) ignored law concerning selection of E-2, which required an extensive, expensive, and time-consuming Environmental Impact Statement. Instead, we could be celebrating a decade of driving on an equally well-designed, safe C-3 that uses more of the existing U.S. 95 footprint than E-2 would on the flank of Paradise Ridge. E-2 is touted by its proponents as having less impact on farming, and is cheaper, shorter, and safer than C-3. What does ITD’s Draft EIS say? Compared to C-3, E-2 converts 55 percent more total land, 100 percent more prime farm land, and 36 percent more farmland of state importance (Table 42, pages 147-148). It also removes 34 percent more land from the Latah County tax base, through new right-of-way acquisitions. E-2 would cost $4 million more to construct than C-3 (page 11). For the nearly six miles of new alignment with either alternative, C-3 would be a whopping 475 feet longer than E-2 (Table 52, page 174). Using ITD’s data (Safety Technical Report Appendix D and page 174) and doing some simple calculations, the chance of safely traversing the “least safe” C-3 route is 99.99951 percent per trip, and it skyrockets to 99.99966 percent if you travel on the “safest” route, E-2. And your chance of an accident at any access/entry point along E-2 (0.0022 percent) is actually double that for C-3 (0.0011 percent). This Wild Idaho Rising Tide (WIRT) event alert and upcoming newsletter cover mostly Idaho- and Montana-centric developments in the oil and coal train and terminal issues since late October 2014, in hopes of eventually sharing more news about hundreds-strong turnouts at Spokane and Olympia hearings on the Washington Marine and Rail Oil Transportation Study in October, along with stories about several blockades of train tracks and a state agency by our great Rising Tide and allied comrades in the Pacific Northwest, since WIRT’s mid-July Sandpoint “bomb train” protest and regional actions with Spokane Rising Tide. After scrutinizing bus schedules, car rentals, and travel logistics over the weekend, WIRT activists have discussed and decided to postpone announcing and staging the Keystone XL Pledge of Resistance training workshops in five regional cities until February 2015. Thanks for your patience with this situation. We just do not have the $250 to $300 travel funds or the survival-drained, physical energy to make this rigorous tour happen. Allowing a week for response, we have not received a reply from the larger, national organizers of the trainings, who garnered almost 100,000 pledges and presumably would supply some of the training materials and share much needed inland Northwest contacts. While we would appreciate attracting with these workshops some of the middle ground of the climate movement from Big Green bandwagons toward more assertive, local direct actions, we must remain focused on more pressing regional fossil fuels resistance during January, which only a few grassroots groups are supporting. Although we will miss commemorating the informal fourth anniversary of WIRT (January 17) with a similar Moscow training in our former meeting space, The Attic, we will likely reschedule Sandpoint/Spokane, Boise/Moscow, and Missoula trainings on three successive February weekends, depending on venue availability. By then, various colleges and universities will have rejoined the academic year, and activists may already be in these areas for protests or hearings, as we together raise the hundreds of dollars required in advance for trainer transportation. Attendees may especially benefit from the legal expertise of much appreciated attorneys leading “know your rights” portions of these workshops. Thanks to all of the participants in the Third Annual Stand Up! Fight Back! Against Fossil Fuels in the Northwest! meetings, who have graciously provided input and worked on arrangements for these trainings .